Thanks for visiting our small master bedrooms photo gallery where you can search a lot of small master bedrooms design ideas. Below you’ll find data on bedroom sizing, an extensive gallery featuring all types of small master bedrooms followed by a great collection of design tips. Out of 148,473 bedrooms, 9.85% of them were small enough to be considered compact. If yours falls into that category, don’t feel bad. Only 2.99% have expansive bedrooms, with the majority landing in the medium category at 53.71%. Here’s our massive gallery. To view more photos, just click the numbered link at the end of the pictures on this page (see above). We’ve also included some charts and graphs with useful data at the bottom of the page. While not tiny, this compact master bedroom fits in a sitting/changing bench at the foot of the bed. It definitely adds to the functionality and style of the room. This is a very small master bedroom with green walls, small windows and dark wood furniture. It’s in the traditional style. I like the color scheme here with mustard yellow green walls with matching throw pillow. The small patio is a great feature as well. The built-in window beach is the star here, but so too is the white wall paneling and contemporary dark bedroom furniture. 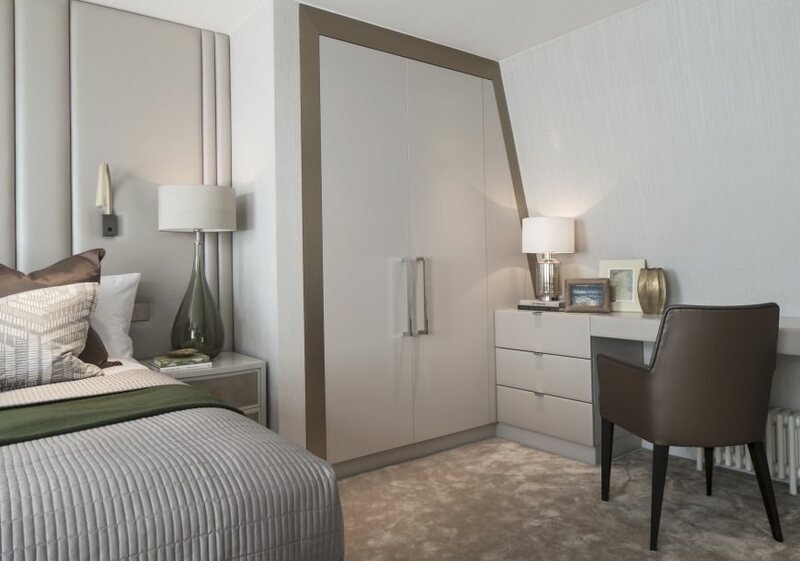 Here’s a great design with plenty of storage for a smaller master bedroom space with built-in nightstands and extensive wardrobes. This is like a walk-in closet and master bedroom combination which is really cool. Stylish small master bedroom with patterned area rug, wall-mounted lamps, curtains and dark accent wall. Neutral narrow master bedroom with wall art above the bed and fabric headboard. I love the small wall-mounted night lights above the modern nightstand tables. Colorful master bedroom with 6 pillows arranged on the bed in a very tight master bedroom space with one small antique nightstand table. This smaller master bedroom uses a full wall mirror to give the perception of a much larger space. 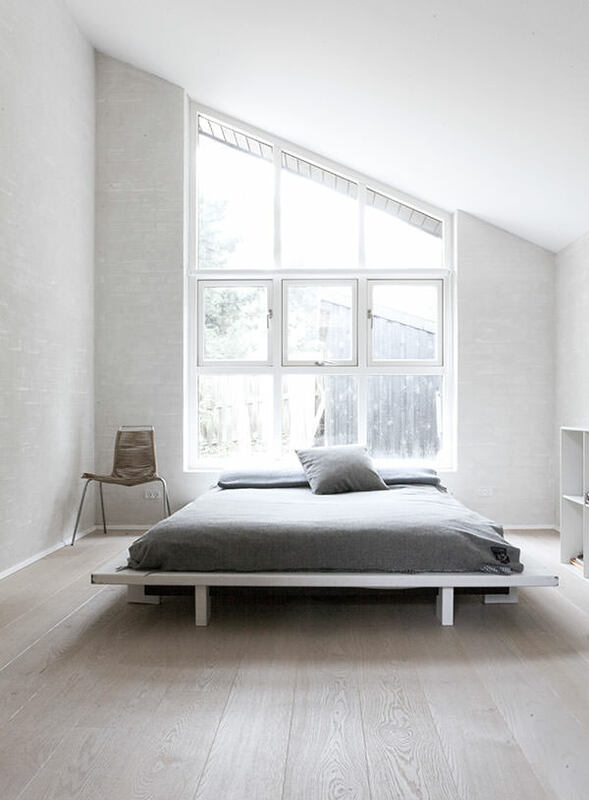 Here’s a minimalist white master bedroom in a small space. 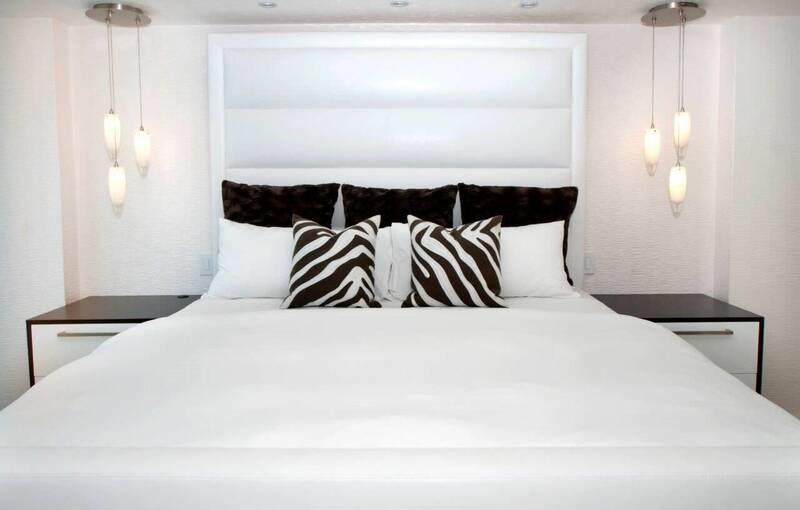 The designer for this master bedroom uses dark and white contrast to create the illusion of a larger space. The white bed and white ceiling contrasts nicely with the dark wood floor and walls. Fun tiny master bedroom with quotes and interesting black and white decor throughout. It’s interesting which mitigates the small size. 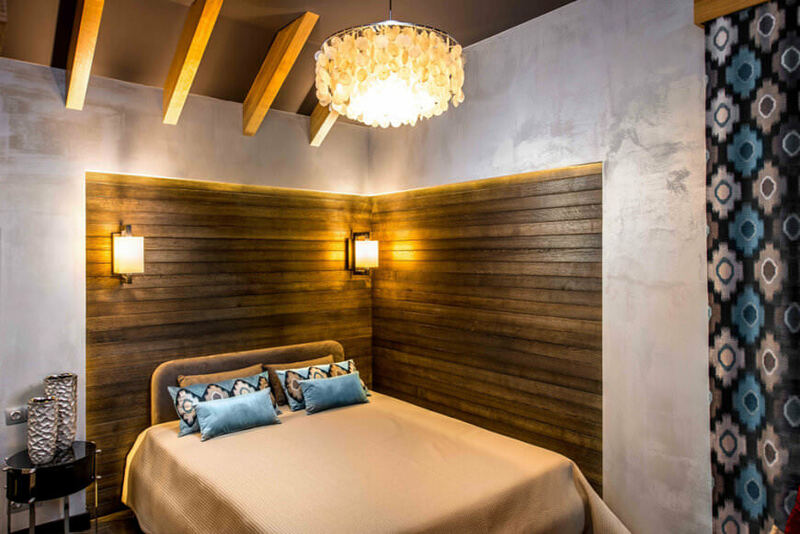 Dark textured walls with ambient lighting minimizes the small square footage of this elegant master bedroom. A very simple compact master bedroom that is very attractive and pleasing to the eye with the cool blue and white color scheme. Large mirror above the small desk area makes the space look larger. Here’s a terrific example of incorporating one color/pattern throughout the room to create the illusion of a larger space. The textured accent wall helps too. Shop this look at Wayfair. Above is a terrific example of how a nook can create the illusion of a much larger space. Throw pillows help make the bed a focal point and take one’s mind off size of the room. Of course the downside is you must make it up each day. Notice how the gargantuan canopy bed makes the bedroom look larger than it is. Granted the above is not a terribly tiny bedroom, it’s not huge and certainly looks bigger with the canopy bed. The ottoman (or small loveseat) is a fabulous way to create more usable space and make a master bedroom seem larger (assuming the room does have enough space for an ottoman or small loveseat at the foot of the bed). Notice how the large window makes the bedroom look so much larger. 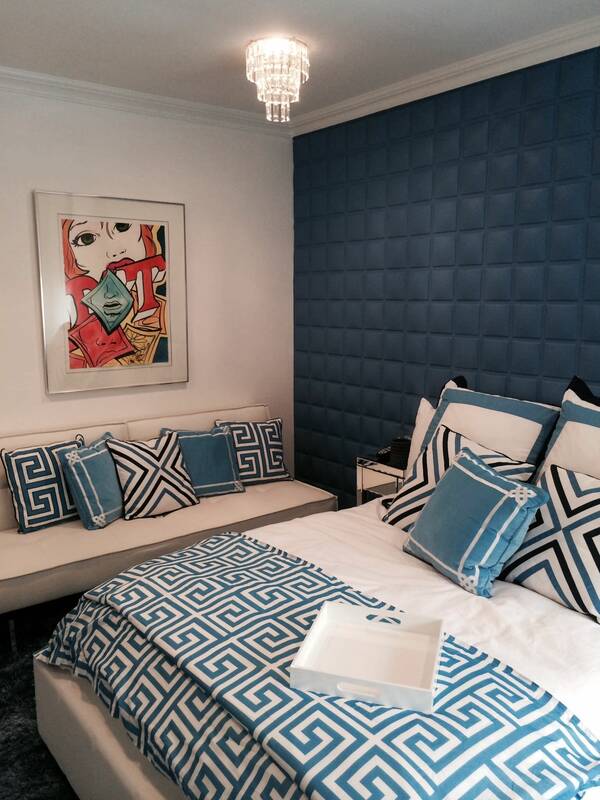 This bedroom was designed by Denise Macedo Architects. See the rest of the home here. The design in this smaller master bedroom is very smart using space to create a terrific matching built-in wardrobe/closet area. Designed by Roselind Wilson. See the rest of the home here. 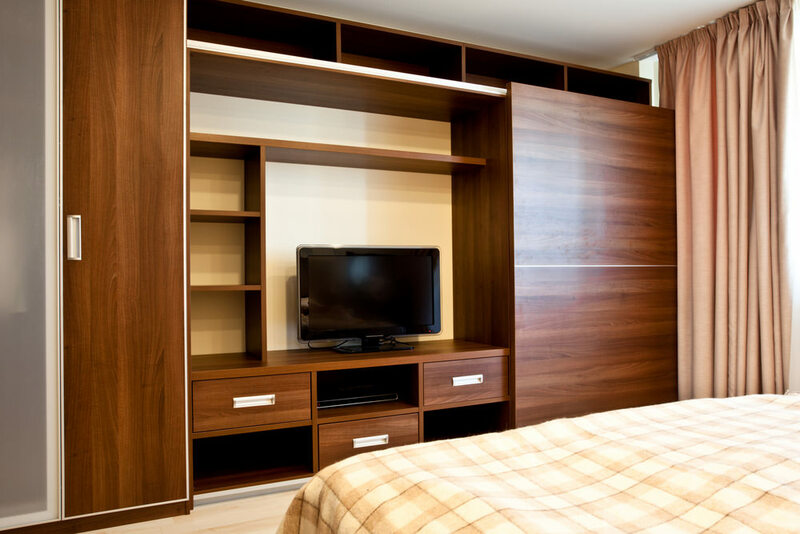 Adding full wall, floor-to-ceiling storage units is a very good use of bedroom space, especially smaller master bedrooms. All white master bedrooms can give the illusion of looking larger than they are. Shop this look. The lower bed creates more space giving the impression of a larger master bedroom. Shop this look here. One would think adding more furniture would be bad, but I really like how this smallish master bedroom placed chairs on each side of the bed next to the small round nightstands. 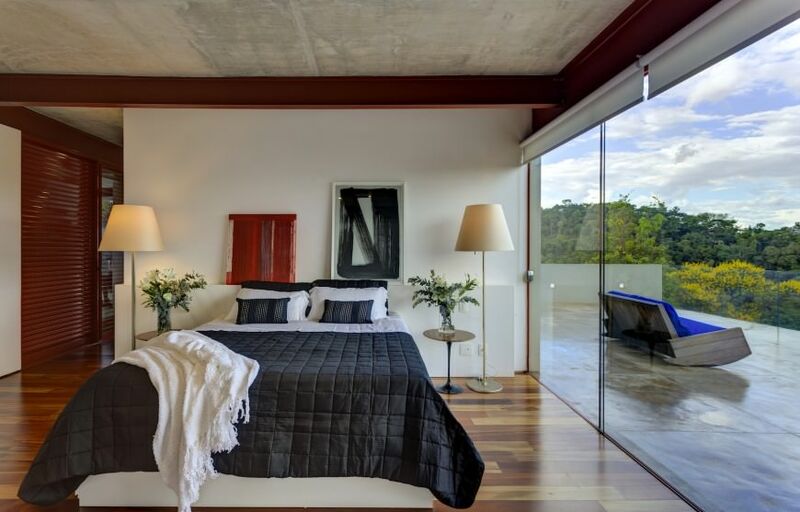 Moreover, this bedroom is made to appear larger with the use of massive mirrors flanking the bed. Finally, check out the ottoman at the foot of the bed. There is a lot going on here, but all of it put together results in creating a terrific master bedroom design in a small space. Shop this look at Wayfair. The nightstands above flanking the bed are ideal for small bedrooms because they provide drawer storage, a surface for nightstand elements such as an alarm clock, books, magazines, tablet, mobile phone, etc. and then there is shelving above. Source: Zillow DigsTM. Here’s smart use of wall space above the bed which allows for more storage. Source: Zillow DigsTM. 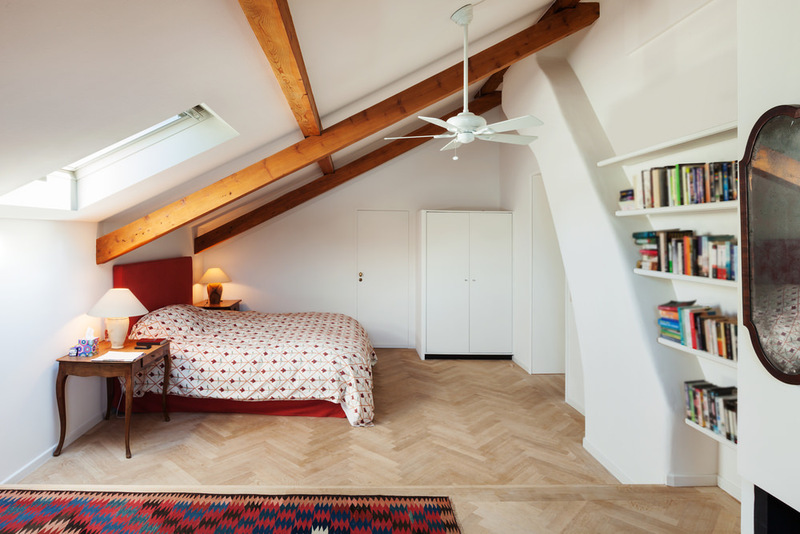 When you have a sloped ceiling in your bedroom, it’s a good idea to place the head of the bed under the lowest part of the ceiling. 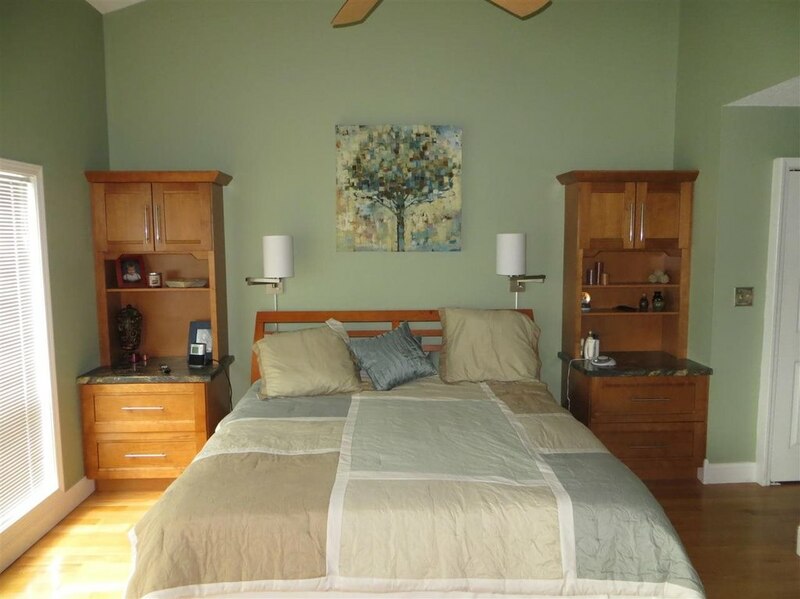 Here’s another example where a low bed creates a larger looking space. This is also a great example of how white makes a space look larger. 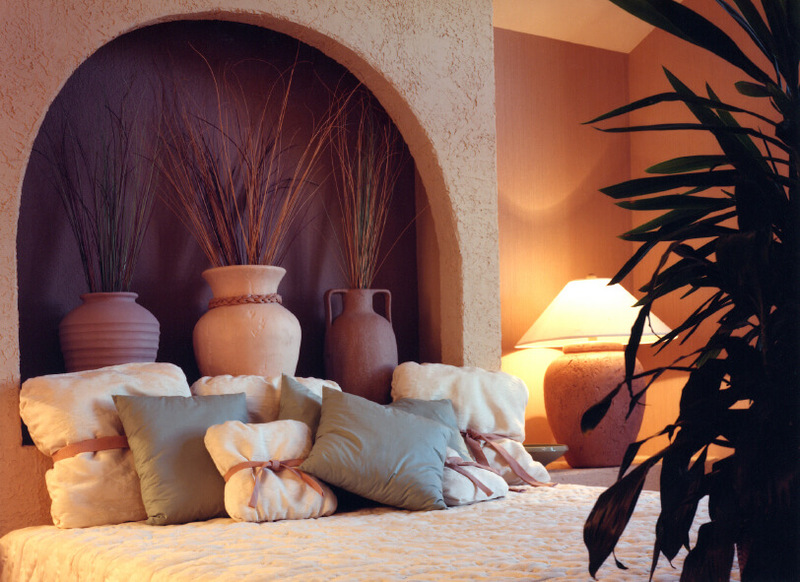 Finally, look at the pillow arrangement – it attracts the eye so you don’t notice how small the room is. This is a terrific example of how to maximize the wall space surrounding and above a bed in a small bedroom. Source: Freshome. I love the horizontal soft striped effect in this master bedroom. Source: Zillow DigsTM. The above bedroom is a small space but appears larger with the vaulted ceiling, light color scheme, low bed and minimalist decor. By NORM Architects. See the entire home here. In the small space pictured above it’s made richer with the use of textures and fabrics such as the ottoman style bench and fabric headboard. Designed by Roselind Wilson. See entire home here. 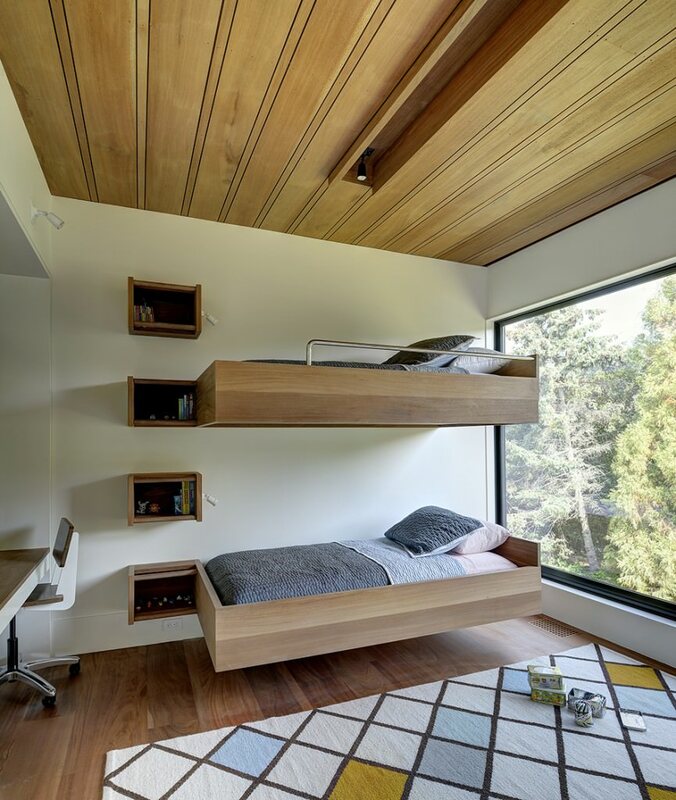 Okay, you don’t have to go the bunk bed route for your master bedroom, but the floating bed is ideal for small spaces. It looks awesome too. Designed by Bates Masi Architects. See more of this home here (it’s awesome). 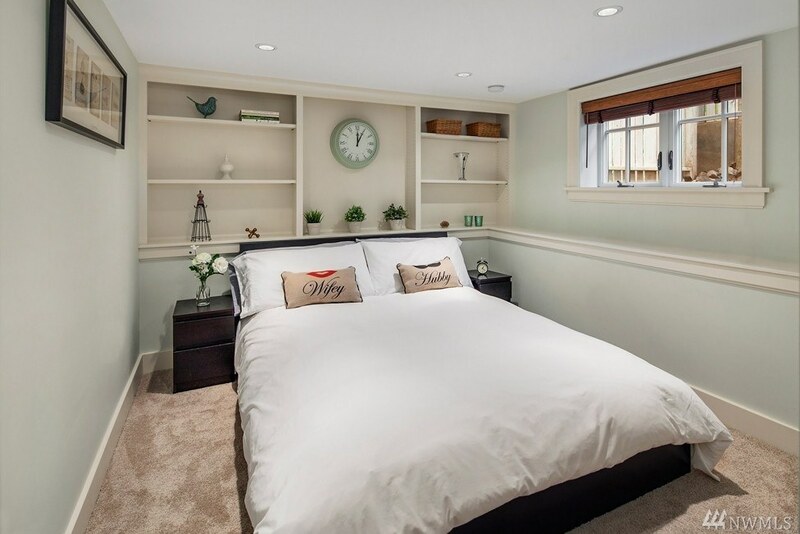 Built-ins beside and above a bed add depth and storage, both of which are perfect for small master bedroom spaces. Designed by Hacin + Associates. See the rest of this home here. This is a very interesting idea for creating the illusion of more space in a small master bedroom. You create an accent section or corner so it appears as a room within a room. Designed by ARS-IDEA. The problem with small spaces is that people often feel that they are too cramped to do anything with. While they may contain less furniture, the pictures in this gallery prove that they do not have to contain any less style. The first step in redesigning a small bedroom is to pick out a design. There are a wide variety of styles in the modern design industry to choose from. Each has their benefits and unique charm, leaving the decision entirely up to personal preference. Contemporary and Traditional designs remain the most popular options appearing in 27.01% and 22.03% of bedrooms, respectively. This information was gathered from an analysis of 582,301 rooms. Choosing the design first allows you to keep any other changes within its color palette. That way, everything goes together when the redecorating is all said and done. A fresh coat of paint is like an extreme makeover for any room. Neutral colors are the most popular by percentage, but don’t let that stop you from painting the walls any color you like. Blue appears in 9.87% of homes, while green is used in 4.07% of rooms. These are based on an analysis of 173,576 bedrooms. Redoing the floors is another excellent way to bring new life into any room. Hardwood and carpet remain the most popular options, appearing in 91.41% of all bedrooms. Surprisingly, concrete is the next most popular with 1.70%. These percentages are based on an analysis of 165,175 bedrooms. Interestingly enough, laminate flooring was only featured in 0.62% of the rooms. While hardwood flooring does have significant benefits, the laminate is still a great cost-effective option. 1. Bed decor: You can do wonders with the look of a small master bedroom space by sprucing up your made bed with throw pillows, duvet selection, quilt and of course style of bed. Additionally, you can make the bed, which is the largest piece of furniture in the room, the focal point with decor items and or eye-catching nightstands that flank the bed. 2. Clothing storage: It helps tremendously if you have adequate closet space in your master bedroom to keep the small bedroom space clutter (clothing) free. If you lack closet space, invest in dresser drawers and/or a wardrobe. 3. Beds with storage: Night stands are great, but if you can find a bed with a headboard that includes shelving space to serve as a night stand, you can free up much-needed bedroom space. You also want a bed with storage underneath. This bed is a perfect example that offers both a headboard with shelving and drawers underneath. 4. Adequate ceiling lighting: Since you’ll have limited space for lamps, ensure you have adequate ceiling lighting with a dimmer. Ideally you’ll have ceiling lights that offer overhead illumination for reading in bed. 5. White or light colors: White walls makes spaces look larger. By all means add an accent wall, wall art and other colorful additions, but make the dominant color white or off-white. 6. Ottoman or loveseat at the foot of the bed: One way to create the impression of a larger space and offering a place to sit in a cramped master bedroom space is to place a sitting ottoman (preferably a storage ottoman for more storage) or loveseat at the foot of the bed. Of course, only do this if you still have sufficient space to walk past the foot of the bed. 7. Dresser/bookshelf combo for night stand: If you decide and have space for a nightstand, consider getting something with maximum storage – drawers, table top space and then shelving to the ceiling. 8. Built-in storage beside and above the bed: If your budget allows, you can set up massive storage systems that wrap around your bed that includes shelving, a wardrobe, dresser drawers, etc. 9. 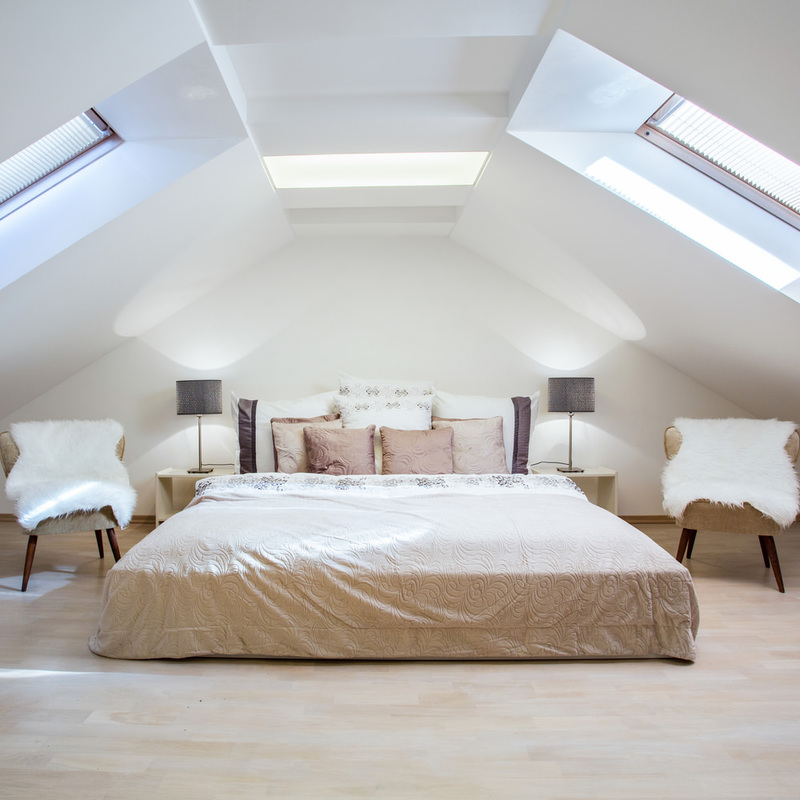 Sleeping Loft: If space is very tight, consider building a loft for sleeping quarters which frees up storage/sitting space below. 10. Large mirrors: While I’m not a fan of large mirrors in living rooms, they’re highly functional in bedrooms and create the perception of a larger space. Go for large, mirrors on closet/wardrobe drawers. 11. Huge canopy bed: One approach is to have a large canopy bed in your small bedroom space. This can give the illusion of a larger space because the bed appears so large. 12. Nesting tables for nightstand: If you don’t like the idea of a massive shelving or headboards for nightstands, use nesting tables. 13. Round furniture: If you have a nightstand, consider a round nightstand table. Round furniture takes up less floor space and is easier to walk around. 14. Color consistency: You can choose a color that you incorporate throughout the room with pillows, quilt/bedspread, wall, flooring, etc. 15. Nooks: Nooks create more space – they can be anywhere including above the bed. See image #3 below. 16. Large windows: If you have the choice or luxury to add large windows to your master bedroom, this will make it appear larger. 17. Low bed: A lower bed such as a low platform bed creates more space which can make the bedroom look larger. 18. Minimalist decor: Go with the pure basics and leave as much space as possible. See #19 below). 19. Accent section: Create the illusion of more space by creating an accent section or corner so it looks like a room within a room. See #23 below. My favorite small bedroom design tip: Built-in storage that wraps around the bed and includes shelving to serve as a nightstand. I think this is the best way to create sufficient storage and it can look great too.